Shenyang, China holds the record for the worst pollution ever recorded - the equivalent of 63 cigarettes per day for inhabitants during the 2015 record high. If you live in a big city you might have the lungs of a smoker, even if you’ve never touched a cigarette. Scientists at Berkeley Earth have taken air pollution levels of major cities and compared them to the effects of smoking. They found that, in some cities, the quality of the air is the equivalent to smoking more than three packets of cigarettes a day. Some of the most harmful pollution consists of small particulate matter, 2.5 microns in size or less, called PM2.5. These particles are particularly dangerous because they are small enough to work their way deep into the lungs and bloodstream, where they can trigger heart attacks, strokes, lung cancer and asthma. The level of these particles in the air is measured in micrograms per cubic meter (µg/m3), usually in an amount that is the average over a period of a year. According to the work of Richard A. Muller and Elizabeth A. Muller at Berkeley Earth, an air pollution level of 22µg/m3 is the equivalent of one cigarette. The city with the worst air pollution ever recorded is Shenyang, China. In 2015, the city recorded 1400 μg/m3, equivalent to smoking 63 cigarettes per day for every man, woman, and child living there. Air pollution levels in New Delhi, India, have been recorded at 547 μg/m3, equivalent to smoking about 25 cigarettes each day. Levels in Europe and the US are much lower. The average in terms of cigarettes per day for China is 2.4, the EU average 1.6, and the US average 0.4. 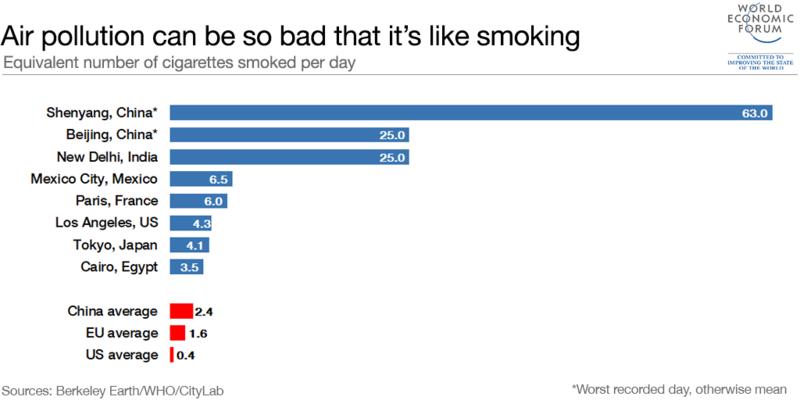 According to an app that takes air quality measurements and compares them to cigarettes, Paris has registered 6 cigarettes a day, Los Angeles 4.3, and Tokyo 4.1. The World Health Organization’s global ambient air pollution map puts Cairo at 3.5 cigarettes a day. The WHO says there are 3 million deaths every year as a result of exposure to outdoor air pollution. Nine in ten of the world’s population live in places where air quality exceeds their guideline limits. 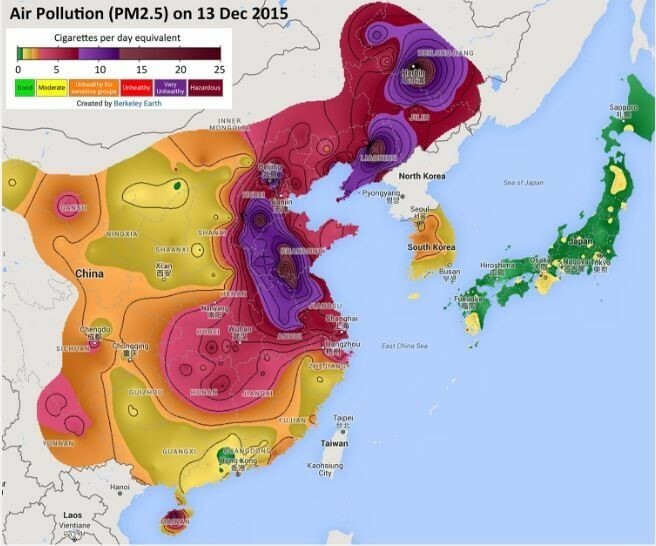 WHO guideline limits for an annual mean of PM2.5 are 10 μg/m3. The real danger is that air pollution directly affects every age group, unlike cigarette smoking. In 2014, China declared a “war on pollution”. It has taken major steps to curb the pollution caused by industrial growth, such as dismantling coal-fired power plants. It is also also investing heavily in energy-efficient buildings, smart transportation, renewable energy and many other green and low-carbon industries. New Delhi’s air quality reached critically bad levels in November 2017, prompting the city’s doctors to declare a public health emergency. In response, the government brought forward measures aimed at slashing vehicle emissions, one of the major causes of the smog, by two years.